Roof repair and roof maintenance go hand in hand, as good maintenance will limit the scope of repair jobs. Minor tasks such as sealing leaks and replacing damaged shingles will preserve the life of your roof and maintain its quality. Additionally, it's often possible to put off the major expense of total roof replacement by making small spot repairs as necessary. Whether you need roof repairs or a full roof replacement, we are the local roofers you can trust. 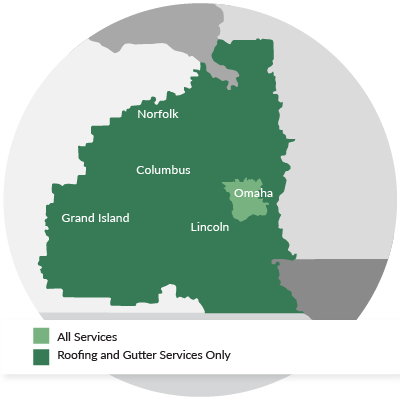 LeafGuard by Midlands Home Solutions serves the Eastern Nebraska & Western Iowa area, providing roof replacements and repairs done by a certified, experienced team of roofers. Contact us to meet with an expert who will inspect and identify your roofing problems, determine the best repairs, and provide you with a free estimate for all work. We proudly serve Omaha, Council Bluffs, Lincoln, and nearby. Whether your roof needs to be repaired or replaced, LeafGuard by Midlands Home Solutions provides quality roofing solutions at a fair price. Our roofing services are designed to restore the overall structural integrity of your roof. Call us at 1-844-807-6136 or contact us online for a free estimate for roofing repairs throughout Sioux City, Bellevue, Grand Island, Kearney, Fremont, Hastings, La Vista, and nearby.